If you’re not sold by now, let’s get things straight right from the beginning: a good lighted makeup mirror simulates the natural light and gives you the chance to properly apply your makeup. The light is essential in the middle of the day and when you don’t have any natural light, one that is the closest copycat is the best choice. How to choose the right lighted makeup mirror? Obviously enough, the bulb is the most important thing to check on your lighted makeup, but there are some other features to keep in mind when shopping. Magnification, size, portability or placement of your mirror are also essential for getting the natural look that you’re aiming for (most of the time, anyways). Try to stay away from the warm and yellow light bulbs, and always go with the white light bulbs that are more forgiving with anyone. You can find LED, fluorescent, and incandescent bulbs, but only the fluorescent and Leds are going to work for the lighted makeup mirror. Without going farther with the details, try to get LED white bulbs for your mirror as they save both energy and money, in the long run. However, most of the lighted vanity mirrors out there do come with fluorescent lights, that are cheaper, and even stronger than you may think. The placement is important as you need various features on the mirror for different places (a wall mount requires an adjustable arm, for instance). What you really need, where you’re going to place the lighted vanity mirror and how much money you want to spent are things to always remember. The market gives you various options that fit any budget and please even the pickiest customer out there! 1.Going shopping on a tight budget is no picnic but you’re not going to go home empty handed when the market gives you plenty of options to choose from. A great value for the money is the Natural Daylight Lighted Makeup Mirror that impresses not only with its price tag, but also with its features. Not only the mirror is a LED lighted type, but also features a dimmable touch screen that is responsive and pretty user friendly. You can get the right amount of “natural daylight replicating” light by simply holding your finger on the touch sensitive button. The adjustability is also another thing to mention as the mirror presents a 180-degree swivel rotation so you can check your makeup from any view. 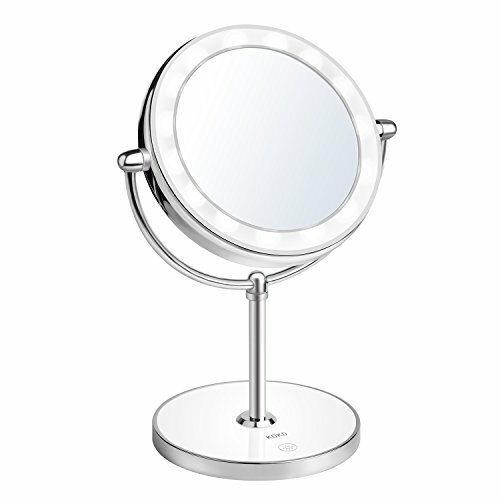 For the perfectionist out there, the 10x magnification spot mirror is a great asset to use too. 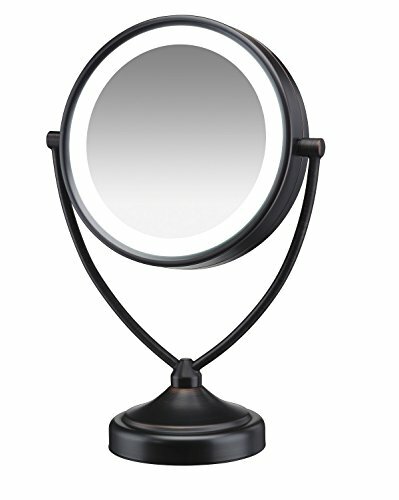 The magnification spot mirror is detachable and comes with rear-mounted cups which ease up the use. The mirror presents a high definition clarity and the 21 cool LED lights are similar to the natural daylight. Cordless and lightweight, the mirror needs AA batteries and it’s great to take when travelling too. The mirror has just the right size for regular use and the setup is very easy. No matter the downsides, for the adjustability, portability and clarity, the lighted mirror still stands as a great choice for anyone shopping on a tight budget. 2.Even though the Easehold LED Vanity Mirror doesn’t come with magnification feature, it compensates with its lightweight and portability, becoming a great model to grab on when going on a trip. 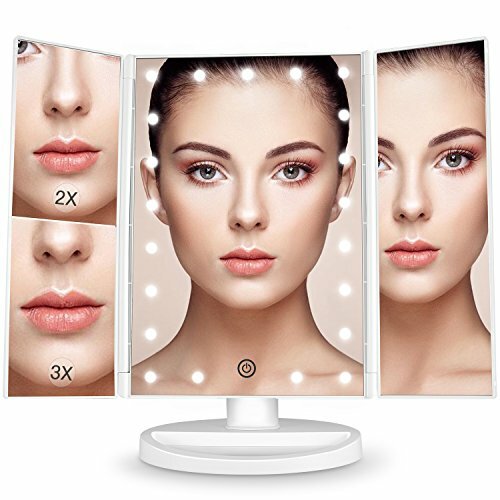 The lighted makeup mirror has a 3 panel design which offers you a wide-angle viewing so you better see your facial features. You can work more on your makeup and take care of the details. The 21 pcs built-in LED lights offer a warm and bright light. The LED lights come with a touch sensor switch for turning the light on/off. Additionally, the light is adjustable and you can dim the light according to your needs. The mirror stands on its own on your countertop and you may adjust it 180degrees. The stability is good and the Base recess may hold your favorite jewelry pieces or various cosmetics. As it doesn’t store power itself, you need to use 4pcs AAA batteries for it or use the included USB cable. All in all, for a good price, you get a portable, lightweight and stand-on mirror that gives good light and helps you improve your makeup skills. 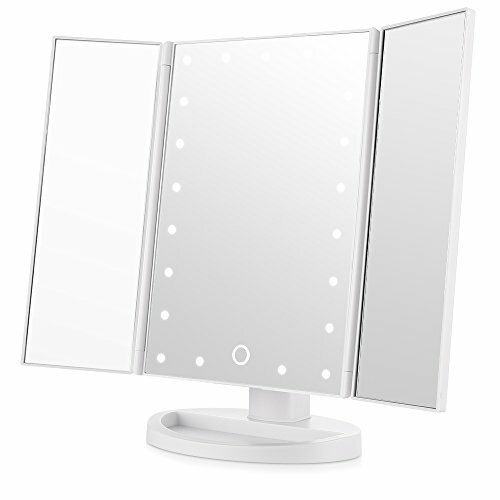 3.The smart design and the numerous features recommend the Bestope Makeup Vanity Mirror with 21 LED Lights for anyone looking for a bright and versatile vanity lighted mirror. Not only the mirror impresses with its features, but also is made with high quality materials for better performance. The makeup mirror surface is made with high quality coating, protecting it. The mirror has a sleek appearance and a polished finish, which increases its value. The mirror comes with 3 panels magnifying 1x, 2x and 3X, so you can take a better look at the details and work your magic when brooming. The wide-angle viewing helps you see clearly your face features, so you don’t miss out on any small details anymore. The 21 pieces LED light ensure a bright light, but you can decide for yourself the brightness since the light is adjustable. A touch sensor switch lets you do that nice and easy, every time. 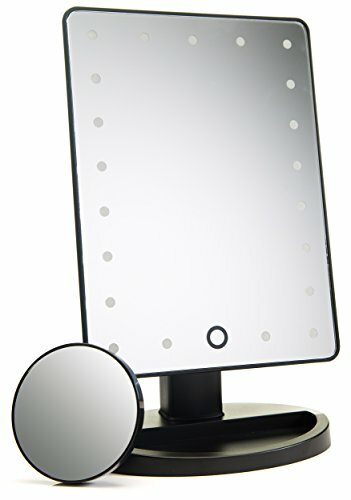 The lighted makeup mirror is a standing model and its stability is good. You may easily adjust it 180-degree for better viewing. It’s a tri-fold model that detaches easy, which makes it highly portable and easy to take when travelling. It’s not a heavyweight mirror and packs quite compact too. You may charge the mirror with 4 pcs AAA batteries or using the USB cable of the mirror. Well-made and with a smart design, the mirror doesn’t look bulky and it’s easy to use. For the plenty of features and portability, the lighted mirror sure is a choice you shouldn’t skip on when in need. 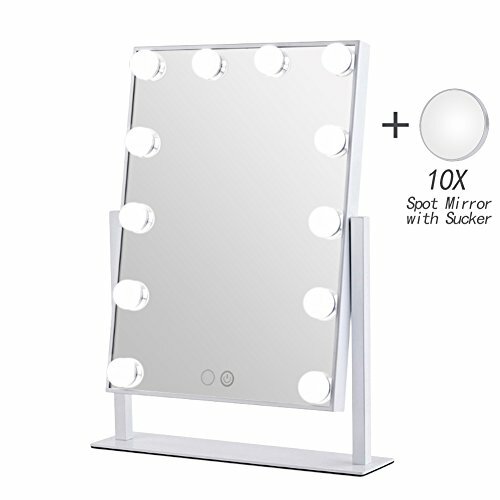 4.You don’t have to break the bank for a good lighted vanity mirror and the Conair Double-Sided Lighted Makeup Mirror is just the right example for that. The lighted makeup mirror manages in fact to check many of the features you may be looking on this type of mirror. The list of good things begins with the attractive price, but the mirror is much more than only affordable. It’s a double-sided lighted makeup mirror that rotated 360degree for standard 1xviewing, but also allows you 7x magnification. Not only you can work better on your makeup, but you can also a bit more on the details. You can easily do your tweezing with this mirror and get rid of the unwanted hairs or any other skin problems that you may be having. The oval design is nice and the mirror looks elegant in any room. The soft halo lighting offers a pretty and incandescent glow. We also have to mention the polished chrome finish that has a subtle and elegant vibe to it. The vanity mirror comes with on/off line cord switch. You don’t have to worry about running out of batteries, for sure. The mirror is clear and it magnifies well. The light is not too bright, yet bright enough to allow you apply your makeup. It provides a white light that is soft enough so you may still look closer into the mirror. Adjustable to any angle for easier use, the lighted mirror matches any décor and is a valid option anytime. Reliable, versatile, not too bright and looking stylish, the mirror is a great addition to any décor and quite a game changer for the makeup enthusiasts. See also the full review. 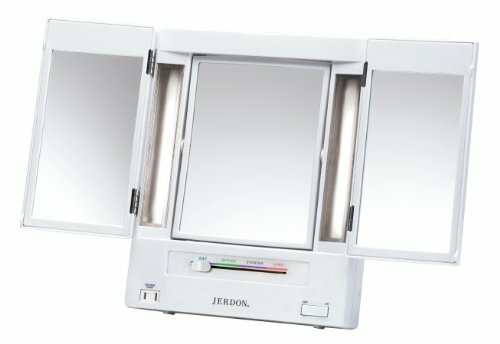 5.One of the most popular options out there is the Jerdon Tri-Fold Two-Sided Lighted Makeup Mirror with 5x Magnification that is a nice addition for anyone applying makeup on daily basis. The mirror comes with adjustable magnification so you can work nice and slowly on the finer details of your makeup. It’s a mirror with built-in electrical outlet, so you don’t worry about not having the batteries for using it. The adjustability of the mirror is one of its main assets and you can set one of the 4 light settings, just the way you need it. You can choose from daytime, evening, home or office environments settings. Each of the 4 settings is designed with color-corrected lighting and you simply slide the switch over to get to the perfect lighting setting for a specific situation. The 1x and 5x magnification options are great and reliable too. The fluorescent lighting and adjustable side mirrors look nice on any table tops. The multiple viewing angles turn the tri-fold mirror into a valid option for most. The back stand is adjustable and you can adapt the whole device (mirror, stand and lighting) for any décor. The mirror folds flat for easier storage and higher portability. As it comes with a built-in electrical outlet, you may also plug in irons and other appliances in the 120-volt electrical outlet. The sleek contemporary look and the pretty white finish complete the description of this popular option. Regardless of the minor issues, the mirror is a reliable, nice looking and adjustable option that doesn’t empty your pocket and does a great job as well. Read the full review. 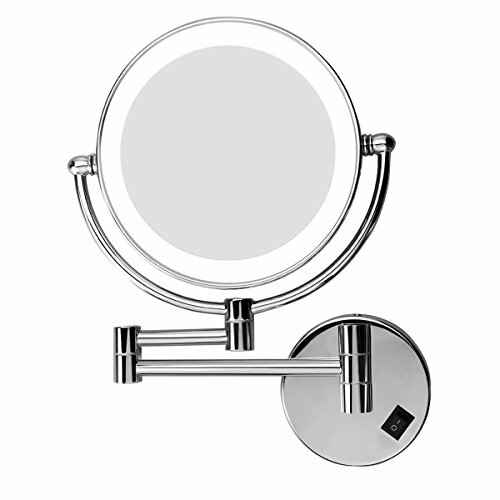 6.The nice brushed nickel finish of the Miusco 7X Magnifying Lighted Makeup Mirror may be the first thing to notice on the mirror, but there are other good things related to the mirror that we need to present. The mirror features daylight LED on both sides so it gives a nice and natural light so that you work on your makeup better than before. The light is adjustable so you can set the light the way you need it in a certain specific. And now that we’re on it, the adjustments aren’t difficult to do thanks to the dial that helps you dim/brighten the light. The direct shadow-free white light from the LEDs gives you the true color of your makeup, removing any worries about an artificial look. The mirror is 8in. in diameter, which is just the right size for most. It’s a thin and distortion-free optical quality mirror that gives a clear image. We also like the fact that the mirror is double sided and has 1 magnification setting: 1X and 7X. this way, you can work on the much more detailed work and tweezing is a lot easier to do. The mirror presents dual power source and may be powered also by batteries (you need 4 AA batteries for it). Well-made and not too heavyweight, the mirror looks nice and it’s money well spent. Nevertheless, the mirror checks most quality boxes and looks nice on any countertop, satisfying most. 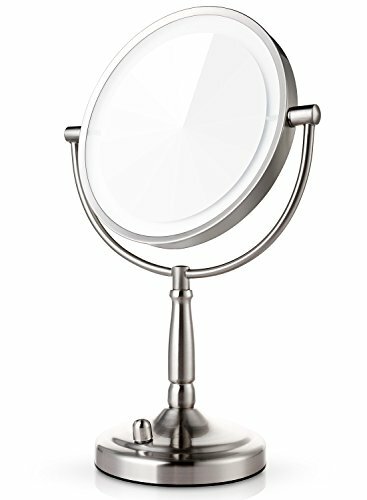 7.If you’re the handy type and you really need a wall mount vanity mirror, take the leap of faith with the Excelvan 7x Magnification Wall Mount MakeUp Vanity Mirror. The mirror comes with 25pcs LED lights that gives you plenty of light to work on your makeup. You’re not going to need to replace the LEDs anytime soon due to their long life span. The light is gentle and not harsh to your eyes. However, it works better if you’re also getting some help from other lighting sources in the room. The swivel function is great and you can tilt and move it just the way you want it, for getting just the right angle for the job. You get a double-side mirror that comes not only with 1:1 mirror image, but also with a 7x magnification that is going to be great for noticing even the smallest details. On the side note, be ready to see them as some may not want to have that! The mirror comes with everything you need for installation. Even if the user instruction has only diagrams and no text, it’s not difficult to install the mirror. Easy to keep it clean and to adjust, the mirror is made with high quality brass material with a pretty polished chrome surface. It doesn’t just look nice and elegant, but its material is also anti-corrosive, rustles and long lasting. As long as you’re focusing on the good, the mirror still stands as a durable, dependable, nice looking and easy to wall mount option for most. 8.Give your bedroom a dramatic vibe with the WanEway Lighted Vanity Mirror with 12 x 3W Dimmable LED Bulbs. The Hollywood feel of the mirror is just one thing to begin with, but the mirror sure brings a lot to the table, not only a dramatic appearance. The mirror comes with 12LED bulbs that give warm light/daylight. The brightness is easy to adjust so you may get just the right light for a natural application of your makeup, even at night. The functions are great and the mirror presents a smart touch control design and memory function. You simply turn it on/off and set the level of brightness by touching the sensor switch from the screen. Thanks to the memory function, the LEDs are going to get back to the same brightness as you used before switching it off. The quality of the mirror is another thing to notice. The LED bulbs are high quality and the mirror has a good build. It has a strong and solid feel attached to it as it features a metal frame and base. It takes the heavy-duty use and it has a long lifespan. The reflective mirror is amazing and made of quality material. As for the LED bulbs, you’re not going to need to replace them anytime soon. The mirror has just the right width and length and looks nice in any room. You can use it for makeup, grooming or dressing. It rotates 180 degrees so you always get the right angle. Coming with an USB cable and a 12V adaptor, the mirror is easy to use and you don’t need to do any wiring or assembling. Regardless of the minor issues, for the impressive looks, adjustable light and solid build, the mirror is a great investment to make for getting that Hollywood makeup you’ve always wanted. 9.The elegant design and the high quality materials are the main assets of the Chende Tabletop Vanity Mirror with Dimmable Light Bulbs, but the mirror is a lot more than that. The 12LED bulbs give a warm light that help you get a natural makeup every time. However, the brightness is adjustable and you may easily dim the lights, just the way you need it for a special occasion. The front on/off rotary dimmer switch is easy to operate every time. Joke on the side: the light is bright enough to get great selfies too! The design isn’t just elegant, but also well thought-out and the mirror has a table top design. Its stability is great, but the mirror also comes with a hook metal so you can easily hang it on the wall. This gives the mirror versatility and eases its use. When we’re going over the build, we notice that the mirror comes with a high quality aluminum frame and a wooden base. It’s long lasting and takes the intense use, for sure. The glossy seamless splicing frame gives the mirror the elegant and high-quality feel that we all love to have at home. Even though the instruction isn’t quite user friendly, the mirror is rather easy to install. It comes with an US standard socket on the side for easier use. Elegant, durable and giving you adjustable warm light, the lighted mirror is a great investment to make for you and your professional grade makeup. 10.The more you’re willing to pay for your lighted vanity mirror, the more you should expect when it comes to overall quality and build. Even though you may be feeling like paying an arm and a leg for it, the Chende Professional Lighted Makeup Mirror with Dimmable Light Bulbs is worth every single penny. For just one price, you’re not only getting a mirror, but also a drawer that is so helpful for storing your makeup products or anything else you need. The mirror comes with 14 LED light bulbs that give a white light. Additionally, the light is dimmable and the front on/off rotary dimmer switch helps you set the right brightness nice and easy. Going on with the details, the mirror impresses with the gloss white aluminum frame that gives it that elegant look. The wood drawer is easy to detach, standing on table top. It’s easy to install also, but don’t rely much on the instruction. The mirror has just the right size for working on your glamorous makeup. It’s made of the optic-quality glass and presents high clarity. It’s distortion-free and great for both makeup and skincare. The wooden storage drawer gives more space for your essentials and skin care products (keep in mind you have to add it to cart when placing the order). The mirror has a high-quality feeling attached to it and take the use for a long time. The bulbs don’t get hot and the light doesn’t hurt your eyes. 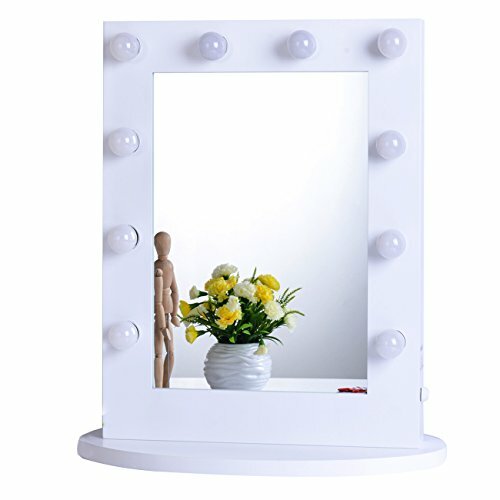 Easy to clean, the mirror completes any décor and satisfies even the pickiest makeup enthusiastic. 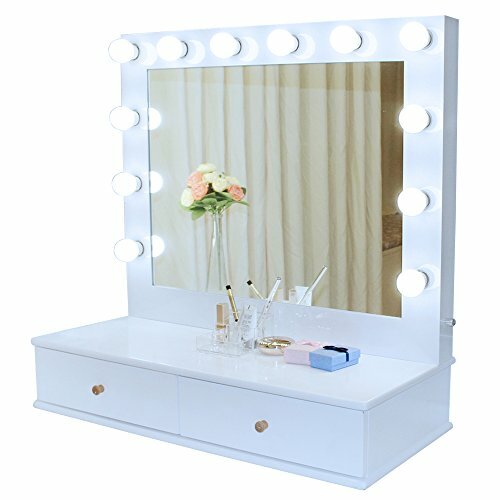 All in all, the mirror gives you the dimmable white light for your makeup and doesn’t disappoint, managing to stand as a wise investment for the long run. See the full review as well. 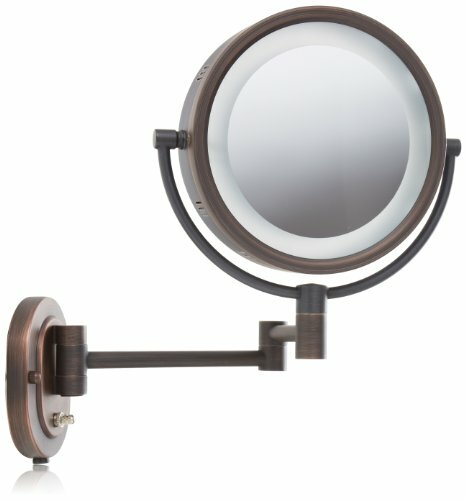 11.If you’re specifically looking for a wall mounted lighted vanity mirror, you can put your money at stake with the Jerdon HL65BZ 8-Inch Lighted Wall Mount Makeup Mirror. The mirror makes a nice first impression with its sleek and modern look, but it’s much more than just a pretty face. It comes with a magnification side so that you can finally get that flawless makeup and work better on your brows. It’s a wall mount mirror that offers 14in. extension so that you can easily reach it every time. It also presents a 360-degree swivel design that runs nice and smooth, giving you the chance to have just the right angle of viewing for your perfect makeup. The magnification is accurate and the mirror is clear and distortion-free. The fog-free and two-sided mirror has an 8.in diameter frame, which is enough for most. The list of features continues with the on/off rotary switch on the oval base that activates the halo lighting that goes all around the mirror. The extension arm and the rotation run smooth, for best point of view. The flexibility is good and the mirror has a good build. It has a nice bronze finish that keeps at bay moisture and condensation. It’s easy to put it together too. The mirror comes with a 6ft. cord with plug and has a sturdy construction. 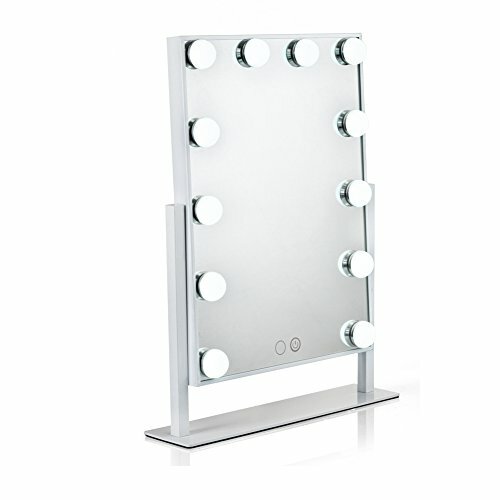 Packed with many good features and easy to wall mount, the mirror is a valid option for all the makeup fans. Read the full review. 12.For those of you out there who are ready for the good, the bad and the ugly on their face, a lighted mirror that comes with magnification is the most natural choice. 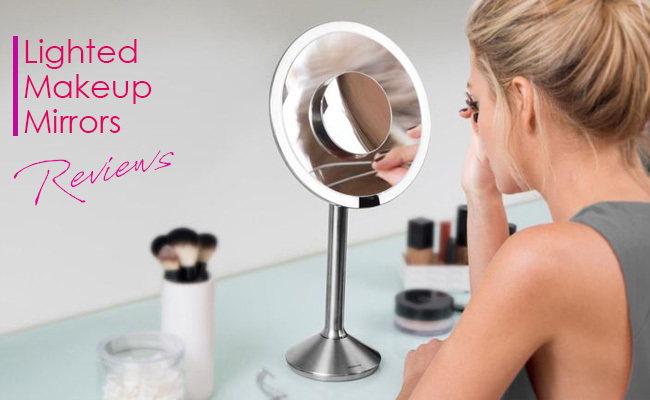 A great option in this category would be the KDKD Lighted Makeup Mirror 1X 7X Magnification that doesn’t just help you pay extra attention to the smallest details, but also checks all the other quality boxes. The mirror is double sided and offers 1x and 7x magnification viewing, which sure gives you better chances to finally get rid of all the imperfections from your skin. Additionally, the mirror rotates 360degrees so you can get the best angle every single time. When we go through the technical parts, we notice the mirror is cordless and rechargeable so you don’t have to worry about not having a socket nearby. It features a lithium battery that lasts for even 3 weeks in case of daily use. Nevertheless, the battery charges pretty fast so you don’t have to stress about not finishing in time your daily makeup routine. The adjustability isn’t bad either and you may set the level of brightness by long pressing the on button. The finger touch on/off button is placed on the Ivory base stand and it’s easy to reach. The LEDs are installed all around and they give a nice and bright light. The mirror does stand out with its sleek and rather high tech appearance and doesn’t have a flimsy feel attached to it. It’s also easy to pack for travelling, in case anyone is wondering. The chrome finished stainless steel and the glass mirror complete the description. All things considered, for a fair price, you get a reliable, accurate and clear double-sided mirror that looks nice and modern in any décor. 13.Where there’s a will, there’s the power so if you’re up for the 10x magnification, you shouldn’t sit on the fence and get already mirror that is up for the task. The Conair Natural Daylight Double-Sided Lighted Makeup Mirror offers you the chance to see all the details that you’re ready to see, for achieving easier that perfect look we’re all trying to get. The mirror comes with an energy-saving fluorescent lifetime bulb that is long lasting. It uses 60% less energy, but it’s 30% brighter so it’s a great choice for anyone going for the bright, yet economic use. The list of features also includes a pivoting head that ensures flexible viewing so you get the best angle for your makeup sessions. The mirror is a double-sided model that has a clear and distortion-free mirror. The 10x magnification is accurate and the mirror is reliable. The profile of the mirror is very slim and the mirror looks good in any décor. It comes with a 5ft. long cord that eases use. We’re not only going for the slim profile of the mirror, but also for its oiled bronze finish that gives it an elegant and timeless feel. The light is nice and similar to the natural daylight. It’s easy to clean and to install. Regardless of the minor issues, the mirror still makes it as a valid option for anyone ready to take the splurge of the 10x magnification feature. 14.Not only the 7x Magnifying Lighted Makeup Mirror from Upper West Collection is easy to pack for travelling, but it also doesn’t disappoint with its clear mirror and accurate magnification. The mirror brings plenty of good things to the table and one of them is the tap-light LEDs that are long lasting and give a nice and precise natural light for best makeup. 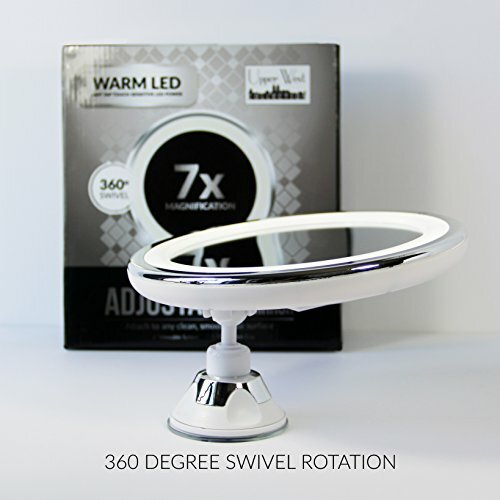 The arm of the mirror is flexible and you can rotate the mirror 360 degrees for getting the right angles for various situations. The mirror comes with a suction cup that is easy to attach/detach every time, without losing its properties. The best feature of the mirror is its collapsible design and the mirror folds down on top of the suction cup, for smaller footprint. It’s a portable mirror and comes also with a free padded travel bag with a zippered pouch for the batteries. The mirror is lightweight and battery operated. The batteries don’t run out fast and need recharge after a couple of regular daily use. The light is warm and bright and the mirror is easy to use and carry when travelling. The 7x magnification is a great addition and the mirror is good value for the price. 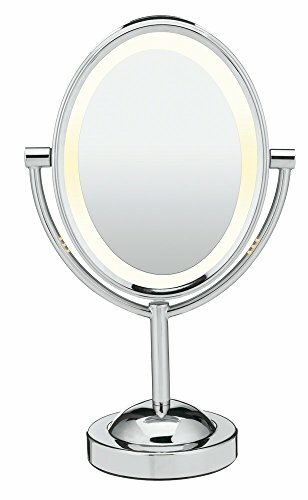 15.Offering natural and bright lighting, the Geek-House Tabletops Lighted Makeup Mirror Hollywood Style doesn’t just help you work on your flawless makeup, but also does it in style, giving any décor a luxurious and elegant Hollywood feel. The mirror comes with a large and thick glass so that you can see your whole face in view at once. The reflective surface is superior and beautiful, distortion-free. You can confidently use the mirror for professional makeup, grooming and even for dressing. The light is bright thanks to the 12 long lasting LED bulbs that present a 50,000hours life span. You can use both white and yellow light, according to your needs. The operation of the mirror is quite easy as it comes with Smart Touch Control and Memory Function. You can touch the screen to go from white to warm yellow light tones. You can even adjust the brightness with a long press. On top of everything else, the mirror memorizes your last brightness when you turn it back on. The stand has good stability and the mirror features a 180-degree adjustable tilting panel, for best viewing angle. Made with high quality materials, the mirror features a strong and solid tinplate metal frame and a solid base too. You don’t need to put it together and the mirror is easy to use. It’s powered by a 12V charger and has just the right size for regular use. As the good definitely outweighs the bad, the LED lighted makeup mirror is a nice addition to any décor and quite a reliable option for makeup enthusiasts.